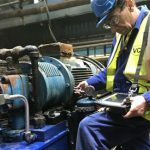 After successfully completing an audit in June 2018, VCI Consultancy Ltd is delighted to announce that we have retained Lloyd’s Register certification for class approved condition monitoring services for a further 3 years. To receive an email notification when new articles are published enter your email address below. Good Vibrations? Connect with us and keep up to date with news, training events and updates. VCI Consultancy Ltd is a registered company in England and Wales.